The first two ordinances expanded the north Ponce de Leon Boulevard mixed-use district to 100, 114, and 126 Calabria Ave. and 912 and 918 E Ponce de Leon Blvd. 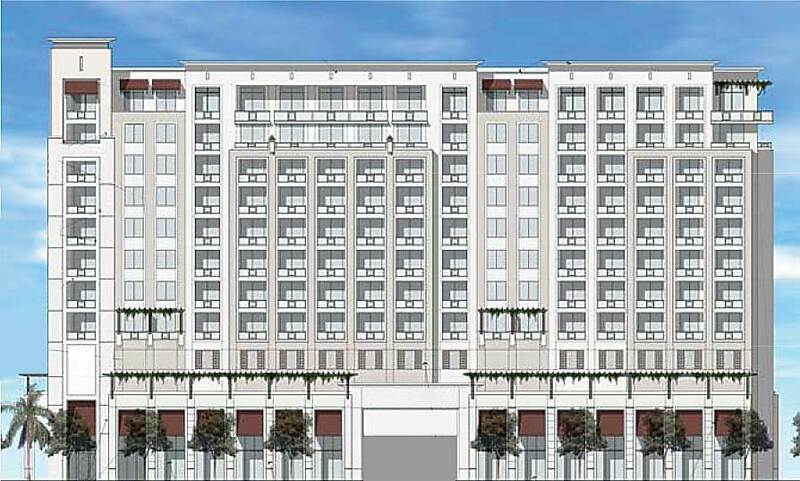 Regency on the Park, a block east of Ponce de Leon Boulevard, very near the Douglas Entrance, would be a 12-story, 130-foot-tall building with 151 residential units, including eight live or work units, according to the ordinance. The total site area will be 1.21 acres and 180,000 square feet with 10 business units in 16,000 square feet of ground-floor commercial space. The 231 parking spaces and 21,246 square feet of landscaped open space are also included, according to the ordinance. The applicant and developer, Alliance Starlight LLC, is headed by Henry Paper as the lead developer. Starlight submitted its application for a comprehensive plan map amendment, a zoning code map amendment, a PAD and a mixed-use site plan on June 13. The process had picked up speed Jan. 25 when a development review committee met. The city’s board of architects met April 5 and a neighborhood meeting was held May 30. The planning and zoning board for the Gables then met June 13 and discussed the project. Along with the neighborhood meeting, letters detailing the potential project were sent to all property owners within 1,500 feet. Both Commissioners Vince Lago and Patricia Keon have championed the project, with Mr. Lago particularly focusing on more green space and paseos. Sufficient areas for the public to enjoy are a major touch point for this project. The plan provides for four times more open space than the existing regulations require and twice the open space that the PAD regulations require, according to the ordinance. Vice Mayor Frank Quesada expressly asked for more oak trees instead of palms to provide more shade. The architect, Robert Behar of Behar Font & Partners, agreed. The project also hopes to include an Art in Public Places installation in the public plaza on the project’s northeast corner. Mr. Paper and Mr. Lago have been meeting to talk about this development for two years now, Mr. Lago said. Mr. Lago also pointed out that a trolley stops right in front of the proposed project, which could also benefit future residents, employers and employees.